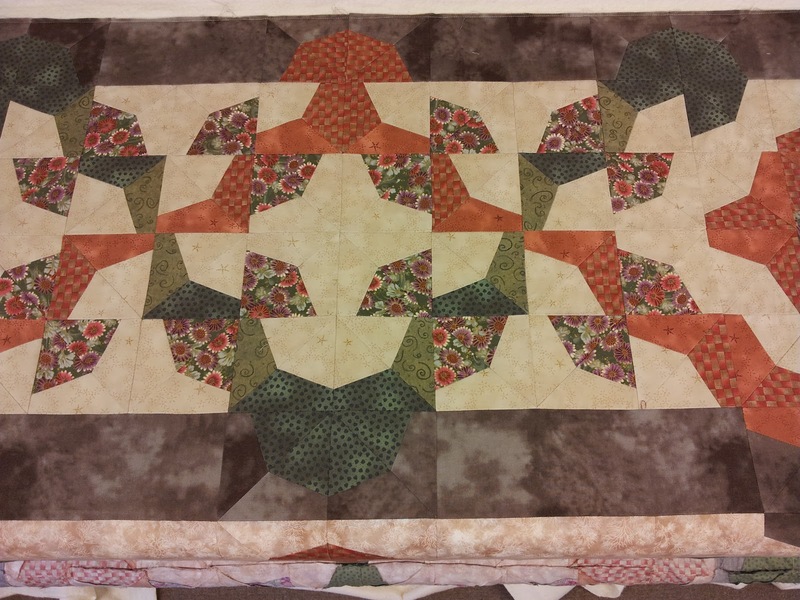 I have a customer called Maggie and she has only been quilting for about 3 years. I was working on one of her quilts last week. Apparently the block is called 'alternative drunkards path' I have never seen this block before. The quilt was big and she just wanted an allover pattern on it. It was so big I had nowhere to lay it out to get a full photo. It was a rainy day and the only space large enough to get a flat photo was on the lawn and the grass was wet. 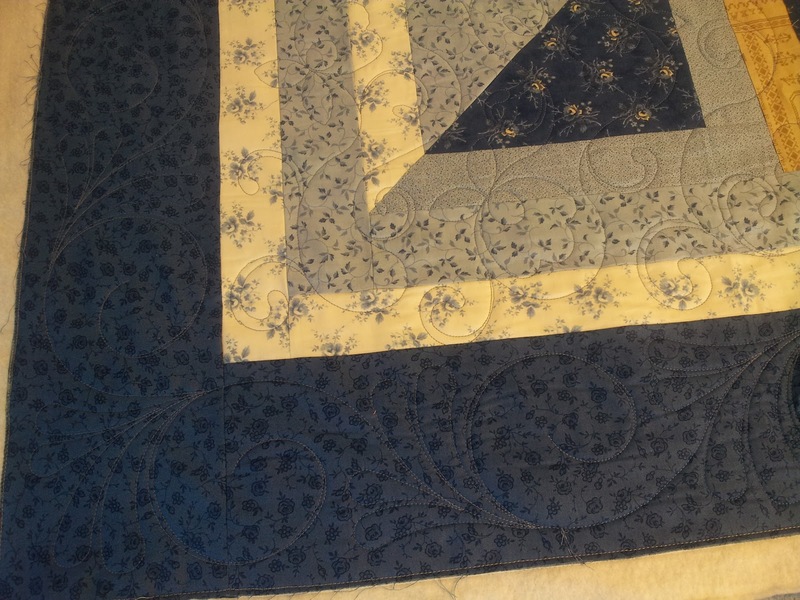 So here are just a few snippets of her quilt. I've just realised that these photos are before I started to stitch on it but I did a panto called 'swirling'. The previous quilt I did for her was this one - AMAZING!!!! I don't think I could make one of these after 23 years of quilting, never mind 3!!!! Once I had closed my mouth, we decided that it really needed to be custom quilted. I stitched in the ditch round all the applique - must have been miles of thread not to mention hours of time! I did a feather wreath in the centre of the stars and continuous curve in and around the points. I then spent hours doing a pebble and peacock meander all over the background. She is so modest about her talent that it took a couple of good friends to persuade her to enter it into one of our quilt show and guess what.... She won a ribbon, YAY!!!! Well done Maggie. I've looked at this pattern for the quilt many times and wondered if I should make one but Maggie has set the bar too high. 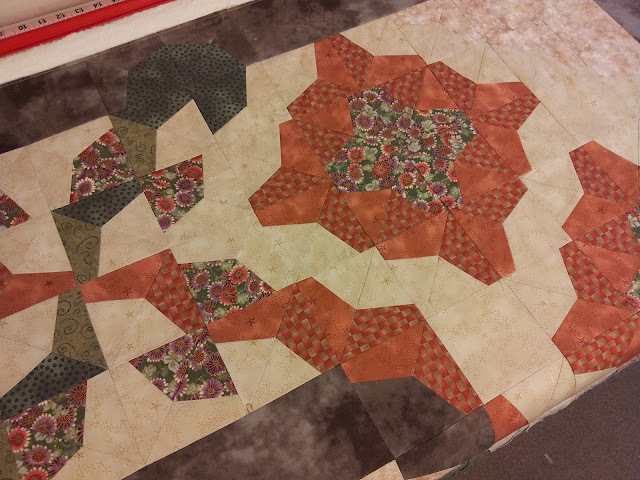 Another quilt I was working on last week was for Philippa. It was a huge one made of 'Blueberry Crumbcake' fabric. It measured 100 x 118 inches so again I could only get a photo of it draped over the machine. 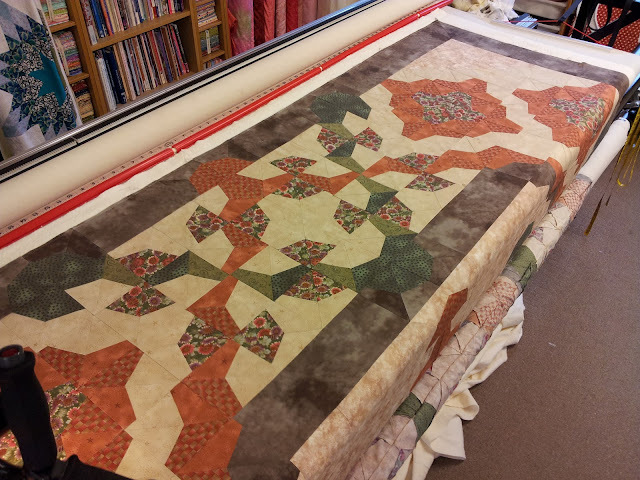 Philippa likes an allover pattern in the centre of her quilts with a separate design in the border. I did a pattern called 'pretty posises' in the centre and a swirling feather in the border. I think you can just about see the stitching. Any bloggers out there that can give me some tips on getting the stitching to show up better on photos, please feel free to impart your wisdom!! Tell Maggie that she should be very proud of her work and so should you. What beautiful and exquisite quilting! Thanks for sharing. Achei seu blog a partir de sewalico e devorei,tudo muito lindo,parabéns.sou sua seguidora agora,mas gostaria de ser sua vizinha...impossível sou brasileira.Beijos. 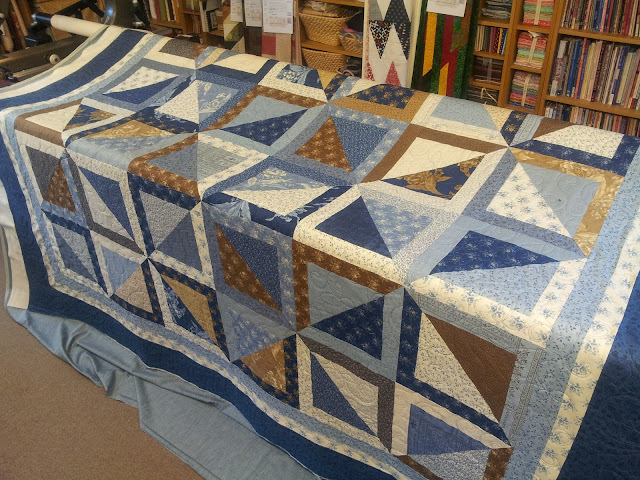 I am in awe of Maggie's star quilt! Gorgeous!!! Hello Chris, how do i contact you re quilting one of my quilts. Thank you.